Yes, right, Man of Steel, I know. How could anyone not know? It's as if a giant cosmic overlord Don Draper took control of the oxygen we all breathe and turned its molecules into Superman-branded particles too small to witness yet impossible to escape. This has its upside, of course; it can, for a few seconds, become a unifying element in the world, when everyone's innate hatred of everyone else is momentarily set aside to enjoy watching what we're told to watch. In that moment life is great and smells like melted butter. Yes, Supermen. I don't know why. There's only one. Chalk it up to translation, I guess. It's Turkish, its outer space is a black backdrop with some Christmas tree ornaments for planets and a few plastic stars, Jor-El is green and Superman is sort of skinny and emotionless. He could be fighting crime, he could be staring uncomprehendingly at an episode of Revenge; he wouldn't seem to care which. This works well for him because the only criminals he has to battle are run-of-the-mill gangsters. You could have just called the police for that, but no, Superman needed to do it. Maybe he knows something about the Turkish police that we don't but it still feels like a light day's work. The most excellent quality it possesses is its nerve, as it blatantly steals the John Williams music from the original Christopher Reeve Superman. A film that will cause alternating fits of boredom and laughter. See it for the ornaments. William Klein is a real filmmaker, an American expatriate in France (still kicking at 85), the director of the vicious and wild fashion-world satire Who Are You, Polly Magoo? And apparently his time living in Europe helped him see American foreign policy as something in need of a good cinematic bludgeoning. So along came Mr. Freedom, a sledgehammer satire of everything ugly about the expression "Ugly American." Mr. Freedom himself (John Abbey) is a parody of Superman with a giant F on his chest, his costume a mixed-up collection of American sports gear, his attitude one of jingoistic, right-wing militarism, racism and destruction. Klein goes for the throat at every turn, strangling the life out of his satire, but the movie is so loud and crazy and flabbergastingly obnoxious, it sort of demands to be witnessed. And it also stars late '60s art house staples Delphine Seyrig and Philippe Noiret as well as Yves Montand in a goofy cameo, so completist cineastes can say they watched it for homework's sake. 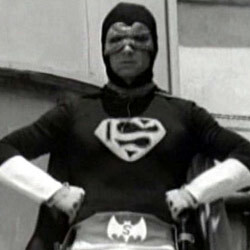 This black-and-white Turkish film features a hybrid Superman/Batman hero with a scrawny "S" on his chest. But whatever the movie lacks in Superman copyright infringement it makes up for with absolute stone-faced confusion, which is its own sort of pleasure. 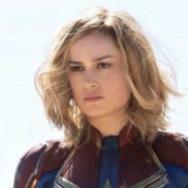 A cross-dressing super villain named Fu Manchu -- he wears what appears to be a black mantilla stolen from a Spanish grandmother in mourning, sits in a wheelchair and never stops cooling himself with a Karl Lagerfeld-style fan -- and his posse of bikini girls and hook-handed thugs manage to cause crime to happen even though they do practically nothing. SuperBatManWhatever runs around a lot in an attempt to simulate action, everyone has an amazing mustache and there are no English subtitles (at least not on the version I watched) so everything sounds like a threat. It's kind of perfect. 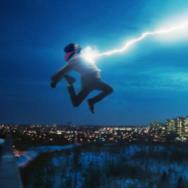 This good-hearted, 2008 Korean film from director Yoon-Chul Chung is a comedy of sorts, about a man who believes himself to be Superman. Past trauma has a lot to do with it; so does what he believes to be Kryptonite lodged inside his head. 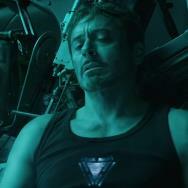 Inspiring other people to do Superman-like good deeds leads to the revelation that he might not be delusional after all. I'd say more but there are strange surprises to be found here, none of which involve faking space with Christmas tree ornaments. Weirdly enough, this is the most mainstream of this entire batch of films but it's also the least readily available. Not on Netflix, DVD copies exist. Be ready to pay. 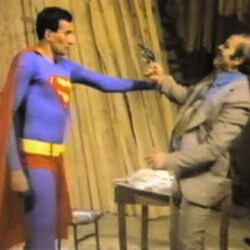 Supermen Donuyor thought it was clever by stealing John Williams' score from Superman. 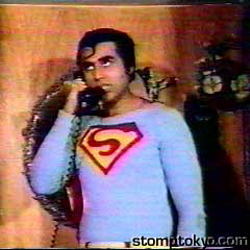 But the Indian Superman from director B. Gupta steals actual footage, so that's great. The supervillain is an evil real estate developer and there are musical numbers, most notably the one where baby Superman break dances to Michael Jackson's "Beat It" and another in which adult Superman disco dances with Lady Spider-Man. Almost nothing here makes any sense at all, as though scenes were shot and then randomly pieced together for an art installation about the fracturing of narrative, like that one James Franco did with a rearranged version of My Own Private Idaho. I saved it for last because it's the best, a triumph of inexplicable cinema. Find it on YouTube or wherever fine, subtitle-free bootleg DVDs are sold, aka the rest of the Internet. Best enjoyed with several Super Bacon Burgers from Carl's Jr, the subject of its own TV commercial (excuse me, short film) directed by Zack Snyder and starring Henry Cavill.